Purpose – The scope of Task 1.4, as described in the Dow, is ‘the identification of basic and representative originators leading to scenarios with cascading effects’. development of a methodology on how to create and use scenarios for testing the IET, including the definition of evaluation criteria for testing (scope of Task 5.2, resp. Task 4.3). As much information as possible from previous CascEff Deliverables and ongoing Tasks was used as the basis for the selection of scenario’s (scenario definition), the methodological steps to define evaluation criteria for testing and as input for multiple timeline development. The CascEff input is completed for the guidelines on elaboration of scenarios and a test script with relevant information from literature and national practices. 3) The rioting in the town of Haren, in the Netherlands (21 September 2012), after thousands of young people gathered for a local girl’s birthday party advertised as ‘Project X Haren’. The strategy was based on information gathered through a review of the literature on the role of the media in emergency management, an exploration of the communication strategies deployed by key agencies in each of these case studies, and the key findings from a critical thematic analysis of 41 semi-structured interviews conducted with key stakeholders between December 2014 and May 2015. CascEff partners will be presenting at the Fourth International Conference on Crisis Communication in the 21st Century (Crisis4) taking place at Lund University, Sweden, 7-10 October 2015. The paper titled ‘The fire was tweeted: Twitter, information flows and the 2015 Channel Tunnel fire’ will be presented on October 10th during a session on ‘Social media and crisis communication’. This entry was posted in News on September 24, 2015 by Erika Hjelm. Members of the CascEff project will present two papers at the European Safety and Reliability Conference ESREL taking place in Zurich. Both contributions are presented in the sessions on Modelling interdependencies and cascades, and the titles of the contributions are ³Investigation method for cascading effects between critical infrastructures² and ³Method for describing and analysing cascading effects in past events: Initial conclusions and findings². This entry was posted in News on September 3, 2015 by Erika Hjelm. This entry was posted in News on May 26, 2015 by Erika Hjelm. Members of the CascEff consortium will be attending the DOMINO congress, organized by the Dutch First Responder platform IFV, the congress will be a joint research and development event about crisis information management during incidents with cascading effects. Dates of the event are the 20th to the 22nd of May. This entry was posted in News on May 20, 2015 by Erika Hjelm. The CascEff project aims to improve the emergency response in incidents that involve cascading effects, i.e. where system dependencies lead to impacts propagating from one system to other systems. An important basis for this improvement is knowledge about the nature, processes and patterns of cascading effects. One way to gain such knowledge is to study past events. This entry was posted in Results on March 31, 2015 by Erika Hjelm. 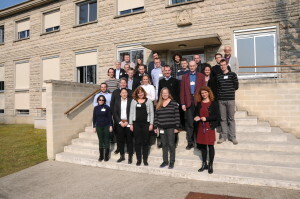 16-18 March 2015 a Project meeting was arranged at Ineris, France. This entry was posted in News on March 20, 2015 by Erika Hjelm. The CascEff project started on April 1, 2014 and runs for 36 months. The project concerns modelling of dependencies and cascading effects for emergency management in crisis situations. The project aims to significantly improve the ability of Incident Commanders to manage complex incidents by improving our understanding of initiators, dependencies and key decision points through the use of the proposed Incident Evolution Tool. This entry was posted in Results on December 31, 2014 by Erika Hjelm. The CascEff-project aims to improve the emergency response in incidents that involve cascading effects, i.e. where system dependencies lead to impacts propagating from one system to other systems. An important basis for this is knowledge about the nature, processes and patterns of cascading effects. This entry was posted in Results on December 19, 2014 by Erika Hjelm.